Although the track listing is similar, Live In Munich is much superior to the On Stage album in many ways. The band sounds tighter and Ritchie Blackmore sounds and looks totally content and in control as is reflected in his phenomenal and often improvised guitar playing. For a complete concert performance, this only contains 8 songs with Kill The King being the fiery opening track. Deep Purple's Mistreated is given the full treatment and Dio does a great job with the vocals. Sixteenth Century Greensleeves from the debut album is given a little bit of an "extension" as does Catch The Rainbow which has to be one of the most stunning performances by Ritchie Blackmore ever. The track ebbs and flows into many different realms with the band being so in sync that they just follow what Ritchie is doing. His soloing just soars throughout this one and it's a much better version than found on the On Stage live album. The crowd gets into a sing along with Long Live Rock 'N Roll; a new track that many had never heard before and Man On The Silver Mountain begins with some cool "doodling" by Ritchie including a few riffs from the intro to Deep Purple's Lazy before ploughing into the signature riff for the song. This one's a real chameleon with many tangents and tempo changes including slow bluesy interludes, extended jams and improvisation. A few bars of Lady Starstruck make an appearance near the end of the track and we even hear Dio chanting about "Night People" during a dreamy passage near song's end. Interestingly Night People is a track off of his Dream Evil album that would surface some 8 or 9 years later. Still I'm Sad once again gets the full jam/improvisational treatment with the song clocking in at over 25 minutes. The set closer Do You Close Your Eyes is a real barn burner and with extended soloing etc. clocks in at over 9 minutes long. The camera work is quite good for something that was recorded almost thirty years ago and even then, Ronnie James Dio had a commanding stage persona complete with bell bottom jeans with moons and stars all over them. The visual effects of the legendary "rainbow" lighting rig are something to behold as well. From the four colour stripes to flashing and marquee effects, it was the visual focal point of the band's performance. What can one say about Ritchie Blackmore that hasn't already been said? All one has to do is watch this concert to see where every single one of Yngwie Malmsteen's ideas both musically and visually came from. From the flashy way of playing guitar down to the quiet improvised subtleties that include many exerpts from classical pieces by Bach and Beethoven. There's even some of the Icarus Dream Suite opus that showed up on Yngwie's first album Rising Force (I swear that he must have a secret copy of this show stashed away somewhere!!). To watch Ritchie play even way back then is something to behold. He "conducts" the band during his extended soloing segments; relaying signals to start or stop certain parts of songs to fit what he feels like playing at the time. It's also interesting to see the early use of tape driven echo machines as we see a reel to reel tape recorder and a Leslie cabinet providing the source of the echo effects on his guitar. Moog taurus pedals add some bottom end to his solo performances and for the encore, Do You Close Your Eyes, the site of a beaten up Stratocaster in Ritchie's hands means only one thing....it's going to be toast by the end of the set! Sure enough, after the rest of the band leaves the stage, Ritchie destroys his guitar and throws it into the crowd after swinging it by the lead and bouncing it off the monitors and eventually his Marshall stacks. Truly one of the greatest rock guitarists ever. Keyboardist David Stone is given lots of room to solo especially on the track Still I'm Sad which also includes an awesome drum solo by the late Cozy Powell. Check out the studded leather wristbands on his arms....a full 2-3 years before it was such a staple of the early 80's metal scene. Also included with the DVD release are some in depth interviews with Bob Daisley and Colin Hart, their former tour manager. Bob Daisley talks about getting the gig with Rainbow as well as his relationships with Ritchie and Ronnie and Cozy. There's also and extensive photo gallery as well as promotional videos for the songs Long Live Rock'N Roll, Gates Of Babylon and L.A. Connection. There's also a mini replica of the actual tour booklet that was issued for that part of the European tour complete with bios of the band members and even all the original advertising. There was a time when these sorts of extended jam laden live performances really didn't interest me anymore. Having grown up listening to Deep Purple's Made In Japan with it's 15 and 20 minute versions of songs, I was ready for the 80's and 90's when live albums pretty much stayed true to the original arrangements but had that killer live sound. With the improvements in technology and sound, most bands can now re-create the sound of their albums in a live situation almost perfectly. The result is that the feel and emotion is gone in favour of a very "sterile" sound. 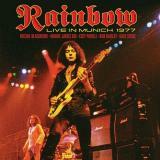 Watching this new Rainbow live DVD has made me once again appreciate not only what a great band they were at the time but just how much of an influence they are to many current power metal and prog metal bands. As well, it's somewhat refreshing to see a band just jamming in a live situation. In this day and age of click tracks etc. used by drummers in concert, there's no room for this sort of free form experimentation. The sign of a true artist is one that can think and play on the fly and the mark of a truly great band is one that can go with the flow to make it all seem very contrived when it really isn't. Although commercial success really didn't happen until the Joe Lynn Turner era of Rainbow with albums like Straight Between The Eyes, Difficult To Cure and Bent Out Of Shape, the Dio era that recorded Ritchie Blackmore's Rainbow, Rising and Long Live Rock 'N Roll will always be the definitive line-up. With Live In Munich, we get to see once again just how brilliant this band was in their prime. To top things off, this show was the only one that was ever filmed during this era of the band...a must for Rainbow fans!! !